It is just enough to encourage personal consumption rather than giving consumers a reason to wait for lower prices. With 2/3rd of the US economy tied to the consumer, you don’t want them to freeze up waiting for a better deal. It devalues cash, albeit slowly/predictably, and that pushes savers to invest rather than hold physical currency or low-yielding cash deposits. This facilitates the recirculation of capital back into society through everything from bond and stock markets to private/venture capital. It gives long term borrowers, ranging from the Federal government to individual homebuyers, an advantage since principal repaid in 10-30 years time will be worth 18% to 45% less than today. Two percent is enough of a buffer to ensure the US doesn’t tip into deflation during an economic downturn. Essentially, the US never wants to end up like Japan (deflation) or a mismanaged emerging economy (hyperinflation). The societal problem with the Fed’s 2% inflation target is that it ignores wage growth. That’s an understandable omission, given that the central bank neither controls the labor market nor the investments that drive productivity. But having the US population accept 2% inflation is necessarily predicated on their seeing at least 2% wage growth, if not more. 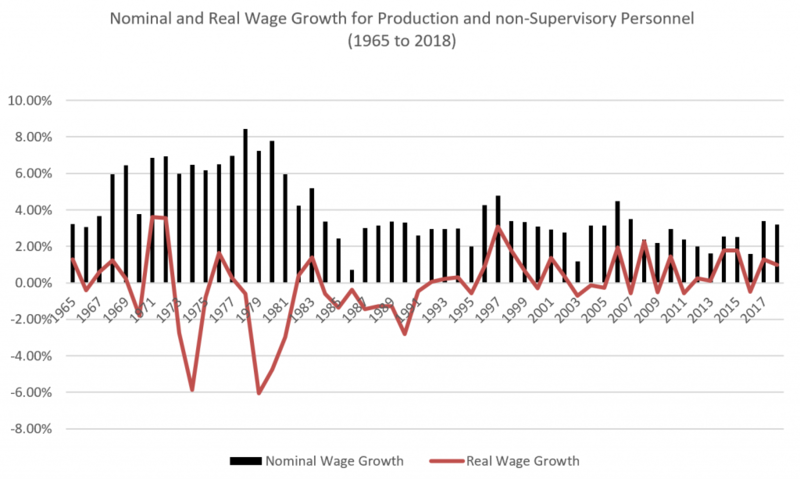 #1: Nominal wage growth has been in secular decline since the 1970s, and at the 2010 – present average of 2.5% it is very close to the Fed’s inflation target. #2: Real wage growth in the current economic recovery is actually better than it has been since 1970. But…Regular NY Fed consumer surveys report that individuals believe US inflation is more like 3% than 2%. And that single incremental inflation point wipes out the 0.7% average “real” wage growth the 2010 – 2018 numbers say is there. Our bottom line to all this: the combination of a 2% inflation target and long run slowing US wage gains (even if now theoretically positive) is a structural problem for the US Federal Reserve. We have no doubt Chair Powell and the FOMC understand the issue. It is a powerful reason for the Fed to let wage gains run for a while, even if inflation ticks higher. Ultimately, they will have to react to the latter to keep investor confidence. But that date is later than markets may realize. Another way to put it: the Fed may be apolitical, but that doesn’t release it from political pressures. Sluggish wage growth is a powerful social narrative running through the US just now. No institution, even the Federal Reserve, can ignore it.